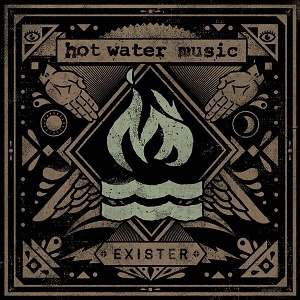 Exister may be Hot Water Music's first album in eight years, but you'd hardly have guessed it. Indeed despite of their hiatus-turned-breakup and a multitude of extracurricular ventures, it's a comeback which finds the Florida quartet functioning as smoothly as ever, yielding inevitably impressive results. It's not identical to the rest of their catalog by any means, and does occasionally seem to lack the bite you'd expect from such an established force. That particular deficiency is, however, made up for by the focus and consistency of its songs, many of which adopt a noticeably upbeat stance in comparison to past works. Single 'State Of Grace' and penultimate track 'The Traps,' for instance, are fabulous, driving punk anthems, whilst opener 'Mainline' bristles with the purpose of a band looking to prove themselves once more. It's not a record littered with standouts, but each and every number does at least present Hot Water Music as a well oiled machine, which in itself is an accomplishment following such a lengthy layoff. No one realistically expected another Fuel For The Hate Game or Caution, but although clearly not of that standard Exister nevertheless manages to hold its own. Built around dependable foundations as opposed to reckless fireworks, it slots in nicely with the rest of the bands laudably solid discography, and comes as a none-too-shabby way to kick start the latest chapter of their continuously dependable existence.